Faith is the greatest battle. To fallen paladin Ederras, right and wrong aren't as clear as they once were, and even the forces of good seem tainted by sin. Lost and broken, the formerly righteous warrior joins up with the crusaders of Mendev, the last bastion of civilization fighting desperately against the demonic tides of the Worldwound. There he plans to rediscover his faith—or die trying. Yet even on the edge of total destruction, humanity's base nature runs rampant, leading any crusader to wonder: is there anything left worth fighting for? 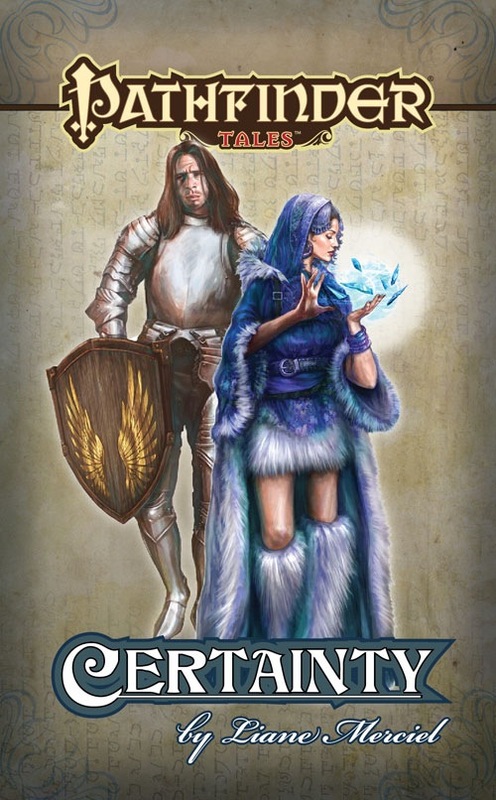 This story originally appeared as part of Paizo's free weekly webfiction series, and is available for free at http://paizo.com/pathfinder/tales/serial. I thought Certainty, a four-part piece of web fiction available for free (here), was fantastic. The story is set in and around Kenabres (a fortified city in the nation of Mendev) that serves as one of the bulwarks for the forces holding the demonic taint of the Worldwound at bay. The author, Liane Merciel, captures the "feel" of being near the Worldwound perfectly. A grim desolation is the prevailing mood of the area, but connected to it is an underlying determination on behalf of those who serve to contain the danger. The main character, a former paladin named Edarras, has come to seek a sort of redemption by joining the armies there, something she knows verges on suicide. I could connect with her as a character (especially having played a former paladin myself), and I knew from the tone of the story that there would be no guarantee she or her new allies would come back from their mission alive. Certainty is one of my favourite Pathfinder Tales stories so far, and I'm looking forward to reading the novels written by the same author. For GMs trying to convey to players in a new campaign the mood and atmosphere of a darker sort of campaign, this story would be a perfect introduction. Edarras and her companions are set to investigate why several deaths have been reported in a small village near the border. The concept of the "Burners", a renegade sect of Iomedae-worshippers who relentlessly (and over-zealously) try to destroy anyone they believe has been infected with the taint of a demon, was quite well-done and effective. The twist was great though: unlike real-life witch hunts in history, sometimes the Burners get it right! I also liked that the madness spreading through the village had a mundane explanation: tainted grain. Finally, it was really cool to see in fiction a "fish out of water" character of the type I've been tempted to play; in Certainty, it's a spellcaster from a desert homeland adapting (impressively well) to life in winter climates. I try to reserve a 5 star ratng for truely outstanding products, and this might be the first one I would rate that high. Absolutely excellent story, very well written. Very likable and believable characters, and the author sows you more than tells you. I loved that both faith and religion where shows in very relivant and meaningful ways. By far the best pathfinder fictio, including the full novels. Well Done. Certainty is a tale told in four chapters. It clocked in just under thirty pages on my NOOK. I read it in one very enjoyable sitting. The story focuses on a former paladin who is dealing with a crisis of faith. With short stories it is too easy to spoil things by giving a detailed review so I won't say much more of the plot. This story provoked an emotional response with me and I love that in a short story. It also made good use of Golarion and is set around the World Wound. In closing I would just like to ask for more Pathfinder fiction from Liane Merciel. 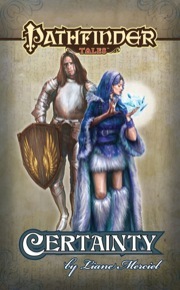 Sign in to start a discussion about Pathfinder Tales: Certainty ePub!